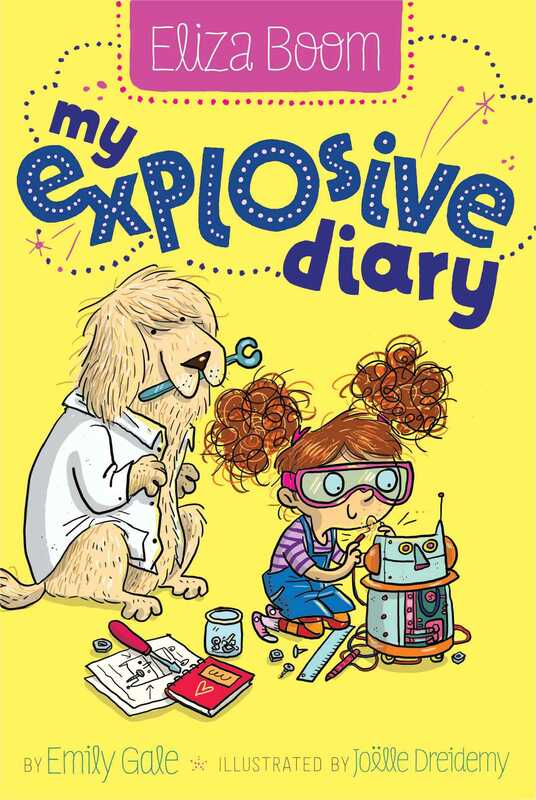 Meet Eliza Boom—assistant inventor, junior spy, and full-on fantastic—as she tells all in this first book of a chapter book series packed with jokes, doodles, and dear-diary secrets! Eliza Boom is having a blast. Her father is an inventor who makes gadgets for spies, and Eliza is his unofficial assistant…very unofficial. Eliza knows if she can just build that one indispensable thing that every secret agent needs, she can be a full-fledged spy herself, but somehow her inventions keep going wrong. Still, with her best friend (well, dog), Einstein, she’s not going to give up. When Eliza’s father loses a top-secret roll of film, Eliza realizes that she might have accidentally given it to class bully Zoe Wakefield, the Queen of Mean. Eliza’s got to retrieve the film, which Zoe is using as a hair bow, before enemy spies get to it. Luckily she’s got Einstein as well as her own brand-new assistant (and friend), Amy, to help her. Can these three would-be 007s get the film, stop the spies, and get revenge on the class bully? There’s only one way to find out—and that’s to read Eliza’s diary! My Explosive Diary Saturday Night My Lab, 7 p.m.
We’ve been banished to the lab FOREVER. You’ll understand why when I tell you about my latest invention. It was Invention 92: the Super-Sneaky Spy-Cam Collar. This is what happened to it. Don’t worry, Einstein wasn’t wearing it at the time. Dad says that before every good invention there are 99 not-so-good ones. That was number 92. I’m SO CLOSE, Diary. Everyone in my family had the grumps after the explosion. Einstein is the only one who has forgiven me. He understands me even if no one else does. I named him Einstein after the real Einstein, who was a scientist. But he’s dead now. Not my dog—the scientist. He knows I don’t have a bedroom. I have a LAB. Bedrooms are just for sleeping in. I’m too busy inventing to sleep! Dad has a lab too, only his is disguised as a garden shed. Dad is a fully qualified inventor who makes gadgets for spies, and I’m his assistant. I like being an assistant inventor, but one day I’d actually like to be a SPY, too. I mean, why should someone ELSE get to have all the fun with MY inventions? Speaking of inventions, how did my Super-Sneaky Spy-Cam Collar go so wrong? It would have been PERFECT for tracking down where Einstein buries our things . . .
. . . and even Dad’s tools from his tool belt. I showed Alice my invention yesterday before it exploded. She should have been super-impressed, but she barely looked at it. That was very non-super of her. No one cares about any of my inventions—especially Alice. All she cares about is her garden. That’s why she confiscated Invention 91: the Spy Rocket that I invented last week. She just doesn’t understand me or my inventions. My plan was to make Einstein wear his Super- Sneaky Spy-Cam Collar, and then I’d watch the film to see where his secret stash was buried. And that brings us back to right now. I’m desperate to come up with an even better invention. That’s why we’re upside down—it helps you think. It also makes your hair grow, which is probably why we both have big, fuzzy hairstyles. Thinking . . . thinking . . . I just know something will come to me soon. P.S. Since I’m writing my inventions in your pages, Diary, you should have a scientific name, too.